Animal Defenders International : Fur : Help ban fur farms in Poland! 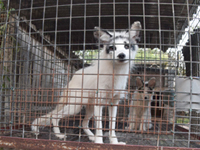 Help ban fur farms in Poland! In Poland, ADI and Fundacja Viva are working to end fur farming, supporting proposals to bring in a ban through amendment of the country’s animal protection act. Our latest investigation documents how animals live and die on a typical fur farm in Poland, showing the reality of this cruel trade and why it can never be humane. Please help us get Poland’s fur farms banned. It will take just a few moments of your time but could help save millions of animals’ lives. Email the National Media Council of Poland’s parliament at sekretariat@rmn.sejm.pl using our template letter below. For other ways you can help end the fur trade, click here. I am writing to express my support for a ban on fur farming in Poland through amendment of the Animal Protection Act. Similar legislation has been already adopted in a number of European countries and worldwide including the UK, The Netherlands, Macedonia, Austria, Slovenia, Croatia and Japan, and is supported by a public majority in Poland. Animals farmed for their fur are denied their most natural behaviours and live in bare wire mesh cages until their deaths. In comparison to the richness of their natural lives, the chronic deprivation and extreme confinement causes animals to suffer both psychological and physical harm. Regulation and certification cannot protect these animals from what is an inherently cruel industry. Despite fur industry claims that methods of killing are quick and humane, the reality is a different story. Animals in fur farms are electrocuted and gassed to death in their millions, with some animals not killed outright causing prolonged suffering. Millions of people in Poland and around the world have been outraged by the findings of the investigation from Animal Defenders International in collaboration with Fundacja Viva! which show how animals live and die on a typical fox fur farm. As one of the largest fur producers, Poland is exporting cruelty to all corners of the global and the world is watching. The reduction of sentient animals to a mere product, bred and killed purely for vanity, is unethical and it is time to change. Please take action to ban fur farming in Poland at the earliest opportunity. Thank you.